A handful of copies left!! Us Three, featuring pianist Horace Parlan, bassist George Tucker and drummer Al Harewood, is one of Blue Note's greatest trio albums. The piano-bass-drums trio has long been the most compact of all jazz combos, a complete orchestra with just three pieces. Some trios have been completely dominated by its pianist including the Oscar Peterson and Art Tatum Trios. 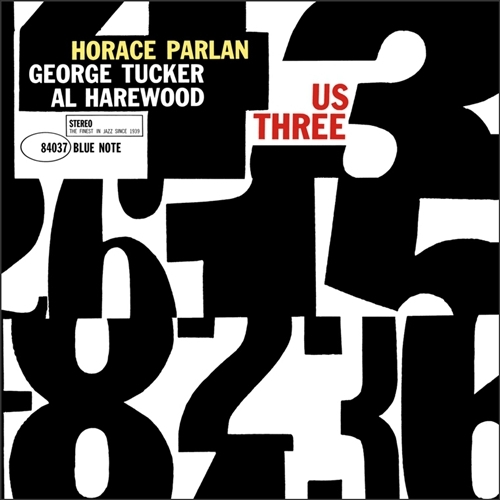 The trio on Us Three is a bit different for it features three superior jazz men who constantly play off of each other, communicating immediately and telepathically in sensitive yet funky interactions. Horace Parlan, already well known at 29 and a member of the Lou Donaldson Quartet, was perfect for the trio format in 1960. His soulful chordal style matches very well with the subtle contributions of George Tucker and Al Harewood. There are some very memorable originals and the trio makes some superior standards sound as if they were written for them. The members of "Us Three" seem to think as one and the resulting music, which has sonics never before realized, is fantastic.